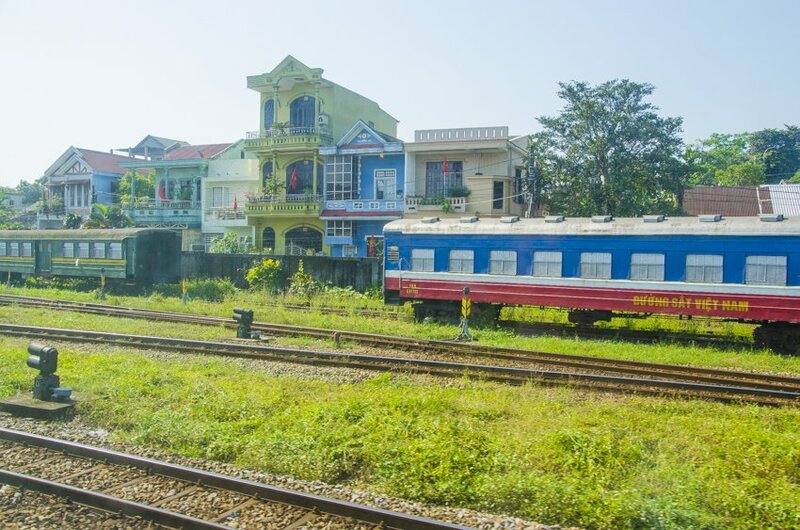 When organising this trip I read a few things about having to experience the train system in Vietnam so I decided to catch the train from Hanoi to Da Nang (because it doesn’t stop at Hoi An). There is also an airport in Da Nang so it made a good base from which to visit Hoi An (the main reason for coming to the area) and to fly onto Ho Chi Minh City (aka Saigon). I have to admit, I have been a little skeptical about people trying to rip me off here. This may be due to the book I’m reading about a Vietnamese-American who goes back to Vietnam 20 years after fleeing from the war, true story. He doesn’t have a lot of luck in the book when he visits Vietnam again which may have made me a bit paranoid. In particular, I am sure every time I get in a taxi they are charging me twice what they should. After being charged a ridiculous amount for one of my journeys I just gave up, as the taxis are metered, and started chilling out about it because when it comes down to it, I’m still not paying much. Anyway, heading to the train station for the first time caused that paranoia to creep back in but thankfully he got me there in one piece at a reasonable rate. Once at the station it was then time to face the challenge of finding my train/cabin/bed. Once in the right carriage I was a bit confused about which compartment and bed number I had. After asking a rather loud American from Texas who was absolutely no help an Irish couple managed to decipher the ticket and room numbering. For most of the way I shared a room with an elderly Italian couple and their Vietnamese-Italian speaking guide, all of whom spoke a little English. What made me laugh was when the American saw who I was sharing with she said, “oh no she’s with strangers”, like being with her and her family would have been better because they weren’t strangers! I can confirm that the Vietnamese overnight train from Hanoi to Da Nang is no more comfortable than the one from Moscow to St Petersburg but a little more comfortable than the overnight train trip I took in India. I booked the best possible bed I could, which was still good value, and the bed was still as hard as nails and the room was cosy to say the least. Oh and of course there was a shared toilet for the carriage. Nothing like going to the toilet on a rickety old train while moving. At least it wasn’t a squat toilet. When I saw that they just folded up the the bed linen ready for the next passengers I wondered how often they actually changed the sheets, at the same time being quite grateful for the silk sleep sheet I’d picked up earlier that day for about €2! After arriving at my hotel in Da Nang, Frangipani Boutique Hotel (would highly recommend), I walked down to the beach to look for some lunch. I was lucky enough to come across a bunch of fishermen bringing in their afternoon haul. It was quite a laborious task and required a lot of team work. Was pretty happy to get some great pictures. The beach at Da Nang is quite nice except for all the rubbish that the tide brings in and leaves on the shore. 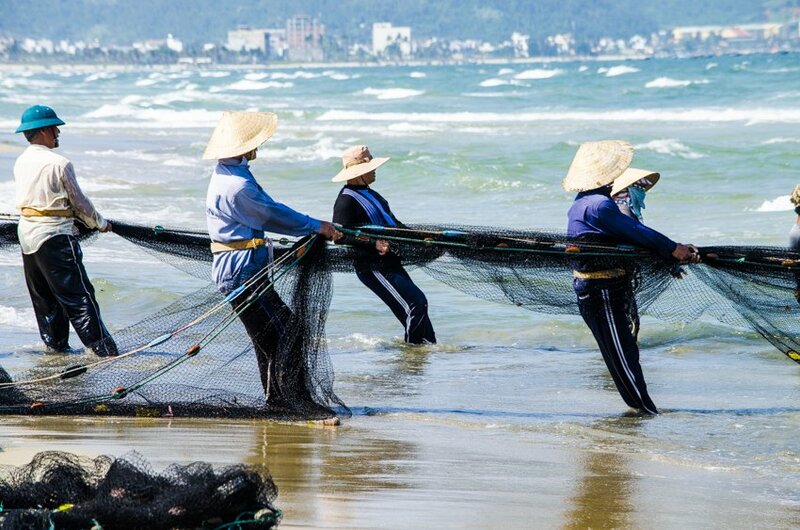 Even the fishermen had to pick the fish out from amongst the rubbish in the nets. After enjoying the fishermen in their element I strolled further south along the beach to search for a late lunch. There were a myriad of restaurants right on the beach and most were empty. In the end I just picked one for no particular reason and ended up being the only customer. Normally I would think this a bad sign but after eating there I was incredibly satisfied with my seafood spring rolls and grilled king prawns with chilli. The thing that seems to differentiate Vietnamese food from any other sort of food is the freshness of the ingredients and this in turn allows you to taste all of the individual flavours. Delicious! Since I had a late lunch I went searching for a supermarket to buy some snacks. I was surprised to see the number of restaurants/street stalls/bia hoi joints that had popped up on the corners of the main road. I guess they are like the western version of a pop-up shop. I’d love to know why they are obsessed with sitting on red and blue plastic furniture that is built for five year olds. Some of them only have one dish they serve and others have numerous, with the fresh fish swimming around in plastic containers. I really want to eat at one of these places but I really don’t want to get sick, which seems to happen quite regularly to westerners. For the time being I’m going to be safe and boring and eat at places that are a little cleaner shall we say. Snobby and unadventurous I know. One Comment on “Vietnam – Da Nang ”. Join the Conversation Below! My girlfriend and I are traveling to Da Nang in a few months and couldn’t be more excited. We would like to settle down and rent a place for a few months. Any suggestions?